The crane runway has at the beginning and end small cantilever beams, so that the wheels go to the support. In these areas, the deformations show impermissible values. What should I do? guided. It can not be distinguished by the program, whether the proof for the examined crane runway carrier is meaningless or not. This decision must be made by the engineer. Usually a simple reference in the static is sufficient for the examiner. 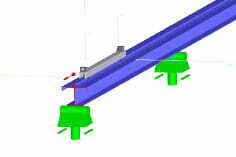 Alternatively one could consider whether such a support is at all relevant for the design of the entire crane runway girder and neglect it when entering the geometry if necessary. In a webinar on the topic " Design of crane runways according to Eurocode 3 " you will find more information about the evidence with KRANBAHN. You can find it below at the links .